Boo Mix - golden grahams, coco puffs, Reeses pieces, peanuts and pretzels - a sweet & salty Halloween treat! This Halloween mix has all of my favorite flavors in it. Golden Grahams, Reese's Pieces, peanuts & pretzels. It even has a little chocolate from some Coco Puffs. Sweet and salty at its best! This is so easy to make. The hardest part is waiting on the candy coating to set. I loved this mix. I found myself walking by it and snatching a bite. I had to give most of it away to save my waistline. Fortunately, this makes a ton, so was perfect for sharing. 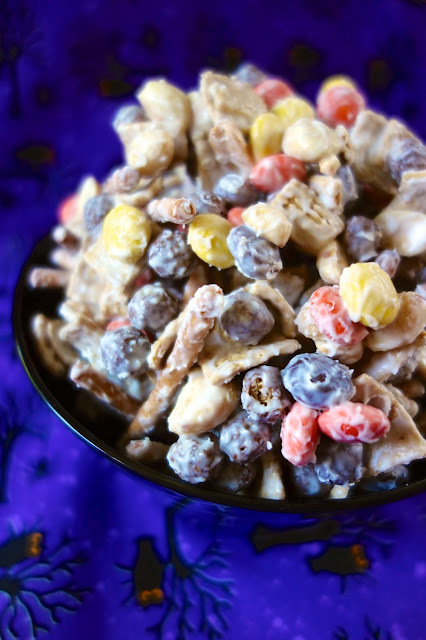 Tie some of the Boo Mix up in a cellophane bag for an easy treat for friends, neighbors, classmates, or coworkers. Place cereal, Reese's pieces, peanuts and pretzels in a large bowl. The largest you have. Break up almond bark. Melt according to package directions. Pour over cereal mixture. Stir until everything is well coated and then spread out onto waxed paper, parchment, or foil. Let sit until completely dry and then break up into clumps. Well don't we just think alike! 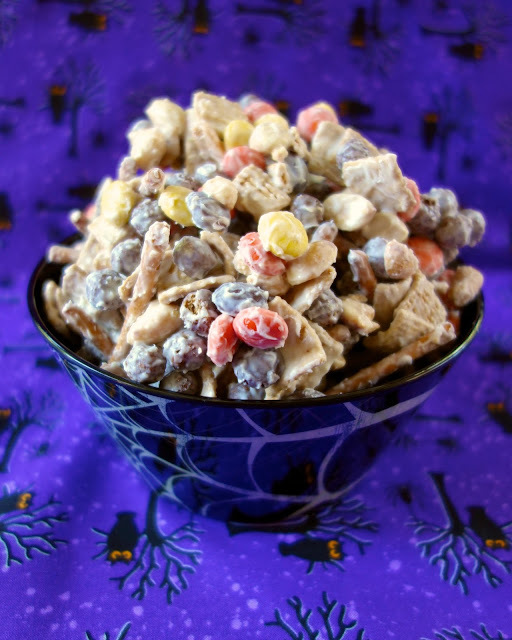 I posted a Halloween Snack Mix today too! This looks fab and yes they are hard on your waistline that's for sure! I need to make something like this. It's the coating that I love. My grandma used to just use Captain Crunch w/Berries with the coating at Christmas- seemed too difficult to make rest of the year- now I know that the hard part was resisting it! Love that idea! I am going to try it. Mixes like this are so easy and addictively good! Good to give away and share :) I love all the cereals you used and the salty & sweet! It's artificial chocolate. Not made with Cocoa butter. used in candy making. you can find it in the same aisle as baking chocolate in most stores.. or in candy making speciality shops. Can u use real chocolaye instead of artificial? This was great. Recently brought it to an all adult event and it was gone. Every person asked for the recipe. Made another batch for my daughters preschool Halloween party. It's BOO-LICIOUS! So glad to hear it was a hit!